Tarawa: The Marines Learn To Use Medium Tanks In A Meat Grinder. UPDATE! I don’t mind if you read and comment on my post, but keep in mind it may have info in it based on old information. This website, www.TanksonTarawa.com has the most accurate info on the Sherman tanks used on Tarawa, their sole purpose it to document their use! So please check their awesome website out. 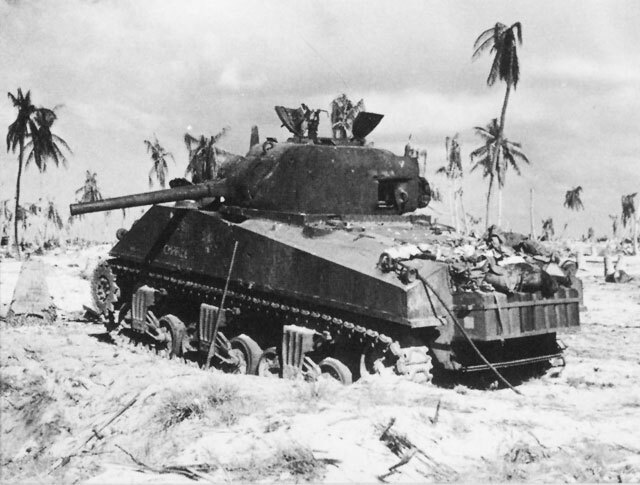 The first Marine use of the Sherman was on Tarawa. The tanks were M4A2 small hatch tanks, these tanks were issued with no training, and the crews of the I Marine Amphibious Corps Tanks Battalion had sixty days in the states to learn how to use their tanks. Then the island they ended up pre landing had no place for them to drive the tanks to train on them. So they went into combat with no real training with the Marines they were going to fight with. The tanks had no waterproofing, and no deep wading trunks, and could only drive through 40 inches of water. They also had the same problem the Army had in Europe, the tanks radios were not on the same frequency as the infantry units below the battalion level. They could talk to aircraft though. They decided they would only need one com0pany of medium tanks, the rest of the battalion would be made up of M3A1 lights. This single mixed battalion would be the only Tanks to support the assault. C Company of the 2nd Marine tank Battalion had 14 medium tanks. All the tanks had names starting in the letter C. The HQ for the tank battalion was almost entirely killed off and their radios lost during the initial landings so each platoon of M4 tanks fought its own war, as would the light companies until the later stages of the battle. This outstanding model was done by none other than the famous and very talented Steven Zaloga, click the picture for more info. 1st platoon reinforced with two HQ tanks were let out of the LCM on the reef and had to drive into shore, they lost three of six tanks to shell craters and swamping while doing so. There were scouts sent ahead to mark a safe path along the reef, but the markers they placed in many cases floated away, and most of the scouts were killed by enemy fire. The three surviving Shermans from 1st platoon were named Cecilia, China Gal and Chicago. Cecilia, a command tank, linked up with China Gal, and they tried to find a way inland. They had trouble getting inland. The seawall was a hellish nightmare, filled with dead and dying marines, wrecked LVTs and other obstacles and this prevented the tanks from moving. While trying to find a way inland Chicago took on water and shorted out. China Gal and Cecelia managed to find a way inland, and found nothing but Japanese troops, and when a Japanese tank, a Type 95 Ha-Go, wheeled into view, it got off the first hit, and got very lucky, its 37mm round hit Cecelia in the main gun and wrecked it. The rifling was damaged, and the breach was open so fragments bounced around the turret and scared the hell out of the crew, but no one was hurt. China Gal blasted the Japanese tank. Cecelia raced back to the beach to check out the damage, and then later hooked back up with China Gal, the company commander jumped from the tank with the disabled gun into China Gal. They spent the rest of the day working with the gyrenes, blasting Japanese pill boxes, Cecelia using just her machine guns. They worked between Red-1 and Red-2 the rest of the day. 2nd Platoons first tank off LCM sank up to turret killing the tank. The next two LCMs tried another spot, and first LCM took damage and sunk on a reef, blocking the second and it managed to back a little way out before taking fire and sinking as well. The tank in this LCM managed to get out, and onto to the reef, only to drown in hidden shell hole moments later. The rest of the 2nd platoon made it ashore on beach Red-3 and moved across Red-2 to hook up with their infantry. These tanks were ordered to support an infantry assault across the islands airfield, and ended up out in front of the marine grunts. One took a bunch of fire and tried to back up and fell into a shell crater and rolled over. The other was damaged by a Japanese soldier with a magnetic mine, and then shot up by a hidden AT gun. They were in the fight for 20 minutes or less. I suspect since the tanks names didn’t make it into the book I’m using as a reference that no one from either crew lived to tell the tale. 3rd Platoon re-enforced with one HQ tank managed to get all four tanks ashore, and had less trouble doing so than the other two platoons. Their good fortune ended their though. Cannonball, a command tank with the platoon leader aboard, Condor, Charlie and Commando and Colorado were the names of the five M4A2s that made it ashore. The commander on Red-3 ordered the tanks to move out ahead of the infantry, with no men in close support, and for the tanks to kill anything they found. In under an hour, Condor was knocked out, how it was knocked varies in various reports, some claim a US Navy dive bomber took it out, but photos of the wrecked tank make it look like an AT gun or infantry close assault took it out. Cannonball took some damage from and AT gun, and in trying to get out of its line of fire managed to fall into a ditch filled with Japanese fuel drums. Apparently fire from a Navy fighter ignited the fuel, but the crew got out. The survivors from both crews were trapped behind enemy lines for a while. Charlie got taken out at close range by an AT gun. The Jap AT gun put multiple rounds through the tanks side. Commando lived up to its name, ranging far ahead of the Marine lines and racking up two AT guns, and five pillboxes before enemy fire knocked it out. Colorado had a gasoline bomb thrown on it, but the driver raced back to the beach and drove into the surf, putting out the fire. By nightfall, only Colorado, China Gal and Cecelia were operational, and China Gal and Cecelia tied into the Marine lines on Red-1 and Red-2, and Colorado did the same on Red-3. Things were all messed up, lots of ships had just dumped whatever cargo was easiest into the LVTs and other boats moving things into shore and there was a lot of trouble getting the things the tankers were going to need. The most important being main gun rounds for the tanks M3 75mm guns. Late that night heavy Japanese machine gun fire rained down on the base of the pier that they were using to bring in supplies. Colorado was sent to help, and shut the Japanese machine guns down soon after. Things had gone poorly for the Marine tankers, but not just them, the attack was so disorganized due to much higher than expected casualties, the Marines only had a small toehold on the island, and a Japanese counter attack during the night would very likely have rolled the Marines right back into the water. Luck was on the Marines side, the Japs were even more screwed up and couldn’t manage one. The Marines started trying to bring in more troops at dawn. These troops were met by a hail of machine gun fire from the Red-1/Red-2 junction. Cecelia, still without a working main gun was dispatched to engage the Japanese machine gun positions at the junction. The tank was only in action for a short time before it slid into a shell crater and its electrical system shorted out. The tank was at a steep enough angle the turret could not be rotated with the manual traverse, and had to be abandoned. I’m not sure if it was shock from the impact when it slid into the shell crater, or if there was water in the hole was deep enough to flood the tank. The M4 hero of the day was China Gal, around 1100, she hooked up with a bunch of gyrene grunts and they attacked south from Red-1 towards the Green beaches. They never actually moved along the beach though, they stayed inland, behind the Japanese positions facing the beach, basically attacking from the Japanese defensive lines rear and flank. Two hours later, they had rolled up the whole western shore, opening the way for more troops to come in, and not under murderous fire. In many cases China Gal had to drive right up to the well-hidden concrete bunkers and blast them through the front slit, or rear door at point blank range to kill them. That night China Gal pulled almost all the way back to Red-1 and holed up with a few infantry around. They slept under the tank and would be back in action in the morning. On day two, Colorado spent the day on Red-3 trying to kill Japanese positions at the base of the Burns-Philp Pier. Several of these positions had been wiped out the day before and re occupied by the Japanese over the night. Colorado worked closely with a bulldozer, the tank would move in close and blast the machine gun position and then the dozer would cover it over with sand, whether the Japanese inside were dead or not. They worked out a system with the marine scouts who had led them in on the reef. The few that survived were used to scout targets for the tanks. The tankers made at least one of these scouts ride in the tank and show them were the action was from the inside at least once. The tank crews wanted to give the scouts an idea of how blind they really were, so he could appreciate and take it into consideration while they scouted. The scouts worked out a system where they would get the tanks attention by beating on the hull with a spent 75mm shell, because they rang like a bell, and could be heard inside the tank, and then using his rifle to indicate a target. He did this by aiming at the target, and then they would hold up fingers for how many yards away the Japanese soldiers were. This worked well enough, but ringing the shell/bell on the hull put the ringer in danger of enemy fire. Of course, once he got the tanks attention, if was the Japs shooting at the scout who had to be worried. These men would also drag dead and wounded marines from the path of the tank. When the progress on the Green beaches was noticed, it was decided to send in 1st Battalion 6th Marines and B Company 2nd Tank Battalion ashore there, B Company was made up of light tanks. One of the first LVT’s in hit a mine on the reef and blew up, once again losing a lot of important communication gear. Due to the heavy presence of mines on the reef and beach, 1/6 diverted north, delaying the landings, but ultimately coming ashore as an intact fighting unit, the first of the invasion. The 1/6 landings went relatively well, but the light tanks of B Company had a lot of trouble. They came in on the wrong tide, and only one platoon would make it onto the reef, only to be 700 yards from shore, and high tide coming. The rest of B Company was diverted Red-2, landing before 1st Platoon got onto the reef. All five M3A1 light tanks from the 1st Platoon got onto the reef, but only two would make it to land, the rest drowned in hole in the reef. The rest of the company got ashore only to lose another tank in a shell crater, leaving only two running. The light tanks laagered in an abandoned Japanese airplane revetment and their crews dug foxholes under the tanks for the night. Crews that lost their tanks, dug in with other crews, under their tanks. At night, anything that moved got shot at, so everyone made sure they had a hole by nightfall. A few more lights from B Company would arrive before nightfall, but the rest still remained offshore. At 0200 more B Company light tanks arrived off Red-2 and started to land and immediately started having problems. Of the first two lights ashore, one shorted out its electric system and was towed ashore by the other, only to be lost to enemy mortar fire. All through the night more B Company lights tried to get to shore. One platoon lost three out of five light tanks to drown out electrical system or other water related problems. By Morning they had five M3A1 tanks from two platoons ashore. 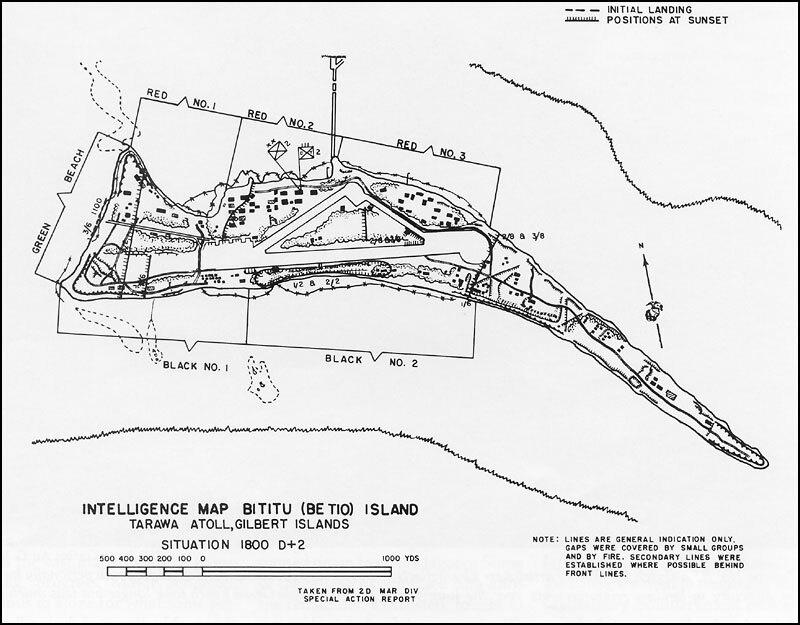 Later that morning 1st Battalion, 8th Marines attacked the Japanese positions at the base of the pier at the junction of Red-1/Red-2. They five light tanks supported the attack, and much like their larger cousins in C Company, the tankers found it hard to find anything to shoot at, so infantry scouts would often climb into the cramped tanks and lead them to the targets. When the targets turned out to be a pill box or bunker, it was found even firing point blank into the embrasures bunkers with little success. They found using 37mm canister rounds at point blank range, fired through an opening worked well enough. They lost a M3A1 to a Japanese soldier who dashed out and threw some kind of explosive onto the engine deck, blowing the engine up and setting the tank on fire. They lost another light to a mortar attack as well. The light tanks would be pulled out and replaced by SPM, the SPM was an lightly armored LVT with a 75mm howitzer in a small turret. These vehicles fared little better than the light tanks. China Gal would be called upon to help an attack reach the group of trapped marines. Elements of two companies from 1st Battalion 2nd Marines had managed to push to the center of the airfield on D-day. The Japanese figured out these marines had pushed far ahead, and attacked behind them, cutting them off. These Marines attacked to the south the next day, trying to break out while the other marines tried to fight to them. The attack to save them faltered, leaving them the nearly 200 Marines of 1/2 still trapped, now in a 200 by 50 yard area of thick bushes and underbrush, and they were low on ammo. A little after 0800 China Gal, and the 1st Battalion, 6th Marines started an attack to relieve the trapped Marines. They also had seven more light tanks from B Company, who had made it to shore, helping. Major Jones, the commander of 1/6 kept tight control on the tanks, not letting any get further than 50 yards in front of the advancing gyrenes. Jones improvised a way to keep in communication with the tanks and kept one light tank back at his HQ to use its radios to control the other tanks. They attacked along a very narrow front, only about 100 yards wide. 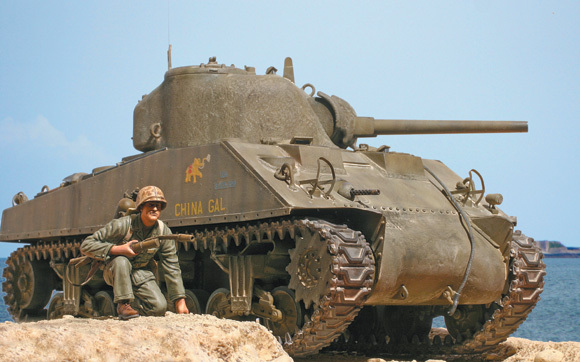 Even with the improved communications with the infantry through the use of the light tanks radios, right up at the front edge were the tanks were actually fighting, the commander of China Girl still found it necessary to open his hatch to talk to the Marines outside. To make it safer, the commander of the Sherman would rotate the turret, so his hatch was to the rear, then pop the hatch and rotate the cupola, the early split hatch commanders cupola rotated, to use one of the upright hatches to shield them from fire. The tank infantry team advanced steadily, losing no more tanks, and crossing 800 yards, they releaved the cut off Marines by 1100. By this point the Marines supply lines had stabilized and a good flow of supplies was making it ashore, but one thing was not. Ammo for the M3 75mm gun was not in the cargo being sent from the ships offshore. This forced the tankers to scavenge what they could from the knocked out and drowned tanks. The two operating M4 tanks would be reduced to firing 75mm pack howitzer ammo, it didn’t seat right, and they didn’t know how it was fused, but it kept the main guns in action. Back at the junction of Red-1 and Red-2, where a large Japanese bunker complex, which included the Japanese Commanders command bunker, was still holding the Marines off. At 0930 a lucky mortar round took out one of the bunkers, causing a huge secondary explosion, this allowed Colorado to move in and knock out the other bunker guarding the main one. While the fight went on, the two B Company light tanks left in the area were used as ambulances, hauling wounded Marines back to an aid station. As night fell, the Jap strong point with the huge bunker still stood. The M4 was used to haul supplies up to prepare for the next mornings renewed attack. Late that night at 0400 almost 400 Japanese troops rushed the Marine lines, attacking B company 1st Battalion 6th Marines, and the Marines won the fight, but it had come down to hand to hand combat. At 0700 on the morning of the 4th day of the battle, Navy aircraft bombed the hell out of the last of the japs holding out on the south east part of the island, a long narrow section, ending in the sea. The air attack was followed by marine artillery and naval gunfire support. One of the Pearl Harbor survivor battleships was off shore to deliver the fire. The USS Tennessee would remain offshore until December support the Marines through the mop up operation. Freshly landed, 3rd Battalion 6th Marines passed through marine lines, heading for the Japanese strong point points on the east side of the Island. Colorado, China Gal and seven light tanks led the attack. They moved in a tight formation of tanks and infantry and rolled up the Japanese troops. The fight had left the Japanese, and many committed suicide. 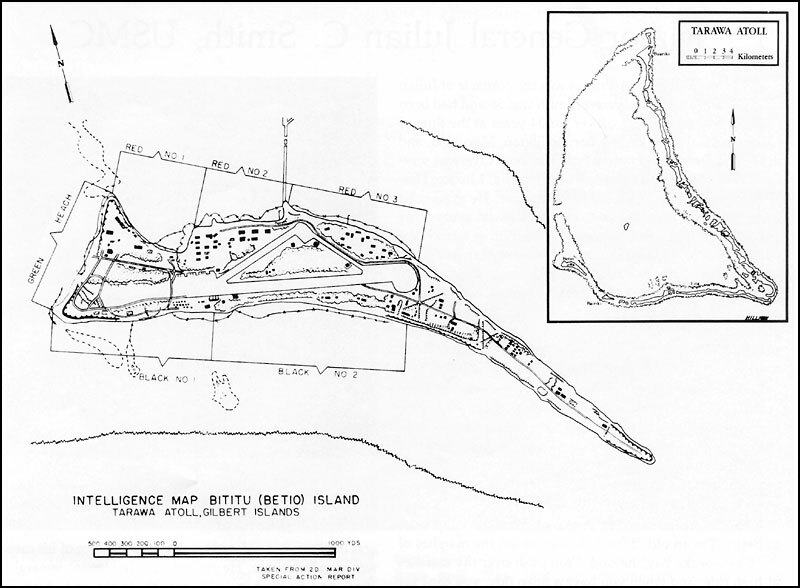 By 1310 the Marines of 3/6 had reached the eastern end of the island. The two M4A2 tanks proved to be decisive weapons at this stage, tearing through the last of the Japanese resistance in the area. 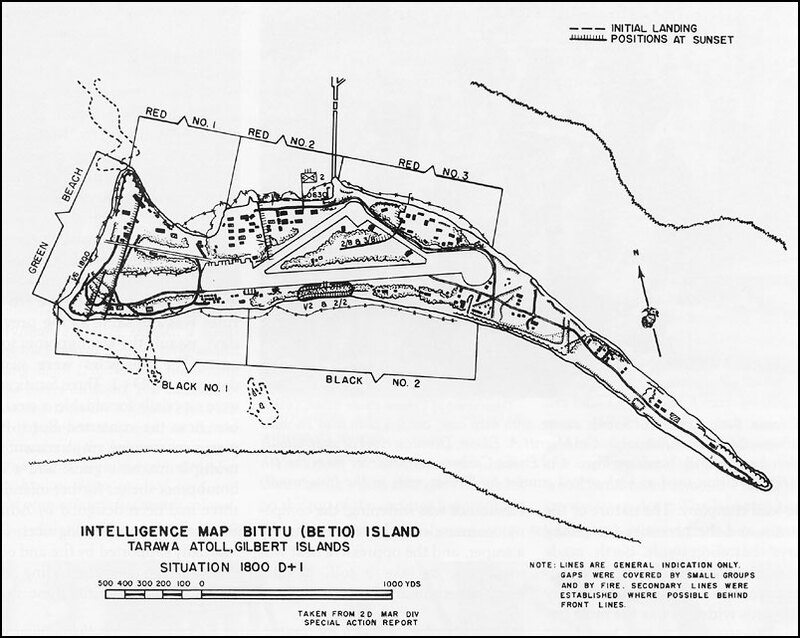 The last area the Japanese were still holding out in, at the junction of Red-1/2, with the big bunker, the area responsible for the majority of the Marine casualties. With only the support of a pair of SPMs the Marines finally crushed these last Japanese holdouts by 1305 when the Island was reported secure. The cost had been one third of the landing force becoming casualties, 1696 killed and 2101 wounded. The Marines salvaged all the M4A2’s they could and took them back to the LSD Ashland, and they were rebuilt in Hawaii and used in later battles. 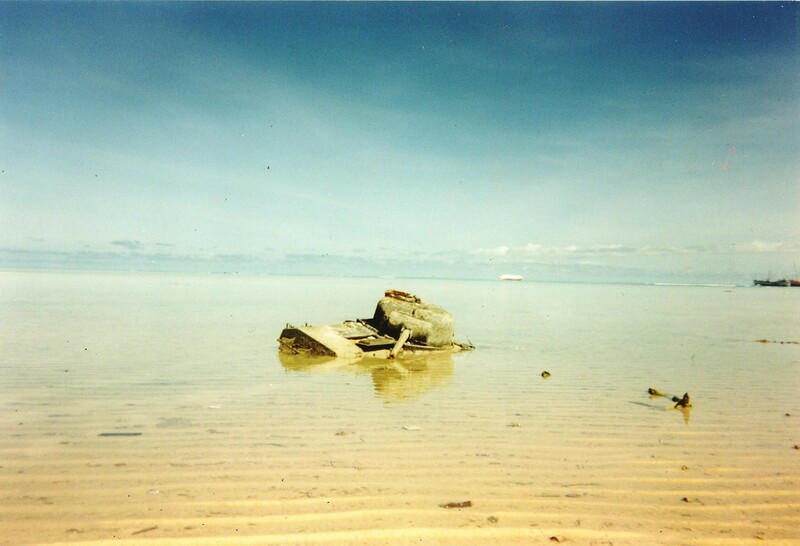 One M4A2 remains on Tarawa, Cecelia, no matter how hard they tried she wasn’t going to come out of the shell hole, and as of 1992 she was still there, a steel monument to the Marines, Sailors and Soldiers who died taking the Betio, Tarawa Atoll. The Marines learned a lot of hard lessons about using tanks at Tarawa; the biggest problem was communication with the supporting infantry units. Another big problem was the vulnerability of the tanks to water damage. It was also clear, the infantry units needed to train with the tanks they would be supported by in combat. The Marines of C Company had been thrown into combat with little training on the tanks, but still proved to be key players in the conquest of the island. The Marines would begin applying the lessons they learned, but not before their next use of the M4, this time M4A1s at Cape Gloucester, a swampy, jungle island in the Solomons, and not the best place for any tanks, but the M4 would prove it worth there as well. Did you want to give credit to the model maker, Steve Zaloga, whose model you displayed with no credit at all? Since I got it from a random internet search, if your sure the model was done by him, I’d love to. I certainly talk about the man’s wonderful books all over the site. “SPM” normally refers to 75mm gun motor carriages, i.e. an M1897 75mm on an M3 halftrack – not an amphibian with a 75mm (LVTA4). I don’t think there were any LVTA4s available for tarawa. That new site is really cool. Have they contacted you?